Nearly five years ago, then-MTA Executive Director and CEO Lee Sander celebrated the 40th anniversary of the founding of the MTA by trumpeting the agency’s next four decades. He spoke as a visionary would, highlighting train routes the city needs to expand and compete over the next four years. Most optimistic — for New York — was his vision for a circumferential subway route through Brooklyn, Queens and the Bronx. Known as the Triboro RX route in planning circles, this train line would use preexisting rights-of-way to connect Outer Borough neighborhoods with radial subway lines, and if the city could enjoy it by 2048, we’d be golden. Or at least that’s what the New York City-centric thinking went. Most other cities have more ambitious plans than that, luckily for them. Let’s look across the pond at a recently completed orbital line. This new line will ease pressure elsewhere and allow travelers to circumnavigate the city without passing through its congested core. Colored rust on the city’s transit map, the new line looks like a huge clockwork orange, closely connecting neighborhoods that were once strangers to each other and further helping the ongoing march eastwards of London’s city center. It’s all part of an ongoing radical overhaul of London’s public transport system, the scale and ambition of which the city (or any western European capital, for that matter) hasn’t seen since at least the 1980s. And it’s all arrived so quietly. For more background on the Overground, check out London Reconnections and, in particular, this 2011 post. The site has tirelessly chronicled London’s efforts to improve its transit network, and as New York builds the small Second Ave. 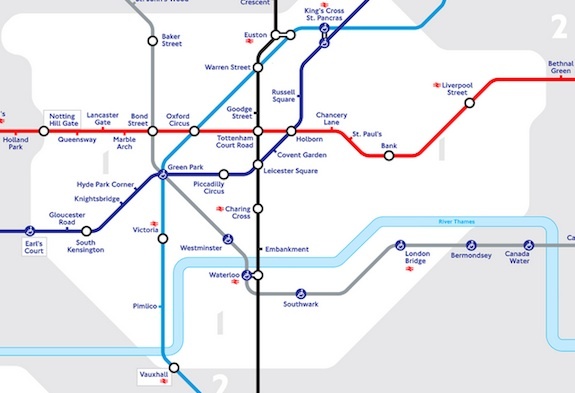 Subway, London has constructed the Overground orbital with Crossrail set for a 2018 revenue service date. If only we could do the same in New York. We could though, and it wouldn’t take much creativity. The Triboro RX line is New York’s answer to the London Overground. Similar to London’s new route (as one TFL planner noted), New York’s proposed circumferential route uses existing rights of way and existing tracks to build out a better transit connection. As the last part of the Overground required 1.3 kilometers of new rail, Triboro RX would require some construction and upgrades, but the path is there, waiting for rail service. What London has that New York does not is leadership devoted to transit. We don’t need ambitious plans or money to dig out new tunnels. We have the plans, and we have the path. We just need politicians willing to commit as Boris Johnson has. For London, the Overground is just the beginning while for New York, Triboro RX remains a dream. As the self-proclaimed center of the universe, though, New York City can ill afford to fall behind its international competitors, but without real transit leadership, that’s exactly what’s happening. GOOD Magazine recently asked its readers to opine on their favorite transit systems throughout the world, and they published some answers earlier this week. The rest, which are available right here on GOOD’s Facebook page, ran the global gamut. People seem to love Paris’ Metro, and Tokyo’s system earned a few pluses as well. While one or two people mentioned New York, the bulk of the comments about our system concerned its cleanliness. So why, I wondered, does New York’s subway system get such little love? It’s one of the few 24-hour systems around the world, and it powers the city. We have new rolling stock, and crime has declined precipitously over the past 15 years as ridership spikes. Perhaps, then, the problem is one of use vs. comfort and the reality of public perception. New York’s subway is very utilitarian in that it’s great for getting to and from various places in New York City and horrendous to look at. As the cars are new, the stations are not, and rats, garbage and grime mar most of the stops. Is there a way to fix this image problem? Despite rising fares, the subways still remain very cheap in New York City, and the average fare, in inflation-adjusted dollars, is lower today than it was in 1996. Yet, until the system looks nicer, and the physical plant — that is, the stations — doesn’t appear to be falling apart, our subway system won’t earn too many accolades from those who ride around the world. In 2016 (or 2017 or 2018), the MTA is going to unveil a new subway line. The Second Ave. Subway’s Phase 1 will run from 57th St. and Broadway to 96th St. and 2nd Ave. It will cost nearly $5 billion. One day in the future, a full-length subway route will run from 125th St. to Hanover Square, and it will be seen as a great accomplishment in the history of a city that hasn’t expanded its system since the mid-1930s. Today, in Beijing, the Chinese are celebrating the opening of five new subway lines that cover over 67 miles. It cost just over $9 billion to build this brand new system, and Chinese authorities believe it will help ease congestion and bring economic development to poor areas of the vast country’s capital. The Chinese aren’t done either. They plan to build out the Beijing subway, currently just over 200 miles, to 348 miles by 2015 and to as much as 600 miles by 2020. So as we sit here waiting for a two-mile subway extension to open in six years if we’re lucky, I have to wonder: Where did it all go wrong? How will we compete in a global economy if our competitors are doubling and tripling their subway lines while we can’t get 12,000 new feet built at a reasonable price and in a reasonable amount of time? For decades, New York City has been the transit capital of the U.S.A. We enjoy an expansive 468-station, 722-mile subway system that runs 24 hours a day and stretches across five boroughs. Transit’s daily ridership is higher than the combined total from every other subway system in the country, and without the subways, New York City as it is today would simply not be a viable geographic urban hub. But over the last four decades, as the region has struggled to maintain its vast infrastructure, expansion plans have fallen by the wayside. Since the opening of the Chrystie St. Connection in 1968, the city hasn’t built out its system. A modest expansion along Archer Ave. and the completion of the 63rd St. tunnel were the major projects during the 1980s and 1990s. Today, at a cost of nearly $7 billion, the MTA is adding one stop to the 7 line and three along the Upper East Side’s stretch of Second Ave. It isn’t, by any means, impressive. Taken together, these developments have emboldened mass transit enthusiasts here and lent credibility to what has become something of a legacy project for Mayor Antonio R. Villaraigosa, who ran for office pledging to build a transit system that would upend long-established commuting habits and ease what has long been a bane of life in Los Angeles. Los Angeles once had a large, intricate and thriving public transportation system, with so-called Yellow Car trolleys that ran on downtown streets and a vast network of Red Cars, operated by the Pacific Electric Railroad, that ran throughout the region. This was dismantled amid the city’s fervent embrace of the automobile (encouraged, in no small part, by oil interests in Los Angeles that realized the economic potential of the car). But with a vote by the Los Angeles County Metropolitan Transit Authority’s board last month to approve the Purple Line expansion, there is a consensus that these projects are going to be built, even among those who describe them as a waste of money in a region that will never embrace mass transit. The projects are being financed by a half-cent sales tax surcharge approved by Los Angeles voters two years ago and expected to raise $40 billion over the next 30 years. Yet, in LA, as the pipe dream of the Subway to the Sea inches closer to reality, residents, planners and politicians are still questioning the wisdom behind the spending. For Mayor Villaraigosa, the $40 billion appears as a traditional bond issue. Since the city plans to add distance and capacity, they can bond against future anticipated fare revenue, but even then, many wonder if Los Angeles can become a city of the subway. Rubin highlights the same capital-vs.-operations battle being fought in New York, but he seems to ignore that adding distance to rail makes pushing for it as a viable modality more appealing. If the subway goes where people need it to go, they will leave their cars behind. If, as promised, a 50-minute drive becomes a 25-minute subway ride, driving becomes a waste of time. Ultimately, Los Angeles won’t move ahead of New York anytime soon, but the Land of Freeways is moving forward. On the East Coast, we’re stuck in neutral. Saddled with debt, unable to issue bonds appropriately and faced with crushing costs, our 106-year-old subway system expands outward slowly, if at all. Ever so slowly, the MTA is forging ahead with a pilot to bring next-generation fare payment technology to New York City. The MetroCard with its swipe and magnetic strip has been outdated since the day it was introduced to the subway system, and Jay Walder, who helped usher in the age of the contactless Oyster Card in London, is pushing forward with a plan to tie subway entrance fees into credit cards with smart chips in them. By reducing the costs of fare collection by just a few cents, the MTA would save tens of millions of dollars every year, and New Yorkers wouldn’t have to carry yet another piece of plastic around with them. Today, we learn that Transport for London is working on its own plans to bring a credit card-based contactless payment system to the Underground, and they’re doing so in conjunction with the MTA, among others. According to The Telegraph, Transport for London officials are in talks with a number of international cities to ensure a common standard for next-gen fare payment plans. These cities include New York, Boston, Chicago, Paris, Sydney and Manchester. Needless to say, a fare cooperative on an international level would be a boon for travelers. It would encourage even more subway use among tourists as negotiating potentially foreign fare systems would no longer be an obstacle to use. This is forward-thinking policy on a global scale.